There is evolving evidence that the previously known Gut-Brain Axis is now viewed as the Microbiotica-Gut-Brain Axis, with critical messages being sent via the Vagus Nerve in both directions. The old expression “gut reaction” is now proven to be valid in that many of our brain’s neurochemicals and hormones are in fact being created in the gut and transmitted to the brain and vice versa. What does this have to do with weight loss? In fact, a healthy gut (and microbiome) is critical for nervous system development, stress response, and appetite control. We have seen recent studies about probiotic and prebiotic sufficiency helping regulate mood, circadian rhythms, and emotions. It is not just the presence or the amount of probiotics and prebiotics that are important, but which probiotics and prebiotics promote certain balance and control over appetite, body weight, food craving and obesity. Previous clinical studies identified Akkermansia muciniphila as an important intestinal bacterium in metabolic health—able to reduce fat mass development in animal models. These studies also confirmed that A. muciniphila contributes to reinforcing the gut barrier to prevent or at least reduce toxins and unfriendly bacteria from penetrating a “leaky gut.” Leaky gut causes havoc and less “happiness” in our gut and therefore loss of balance and control of appetite. A Happy Gut is crucial to controlling our mood and emotions. However, when it comes to food craving, there are other factors at play. A healthy metabolism, the ability to break down fat, motivation and focus on healthy goals with respect to weight management are also important. IDLife has created Slim+ to deliver solutions for these complex issues and to provide ingredients that have the scientific rigor to meet the challenges defined above. To address the Microbiotica-Gut-Brain Axis issue, Slim+ attacks the problem from several sides using a three-pronged strategy. First, Slim+ includes the prebiotic Xylooligosaccharide (XOS), that has been shown to have a clear impact on the gut microbiotica in general, and Bifidobacterium, specifically to maintain blood sugar levels already within the healthy range and support gut health. Second, Slim+ includes Grape Skin Extract which has been studied for the reduction of oxidative damage which may help create a beneficial environment for the flourishing of A. muciniphila and reduction of mood-altering toxins that can affect appetite control. Third, Slim+ includes L-Glutamine, which provides fuel for cells that line the gut for cellular production and cell growth, and assists in the absorption and the transport of nutrients. L-Glutamine therefore helps repair or prevent that dreaded leaky gut while helping to reduce cravings for high glycemic carbohydrates (like that second glass of wine at night). Cravings for sugary and starchy carbohydrates are common and can cause a type of addiction that involves the pleasure center of the brain. When these carbs are broken down into sugar and absorbed into the blood, they can cause insulin levels to rise leading to weight challenges and loss of appetite control. Recent studies have shown that the nutrient Chromium may help to maintain blood sugar levels already in the normal range. Based on this information, chromium may be a player in helping to decrease appetite which ultimately leads to weight loss. Another sugar control nutrient added to Slim+ is Alpha Lipoic Acid. In addition to the fact Alpha Lipoic Acid is called the “Universal Antioxidant” for its multipurpose every day assistance in fighting free radicals, it also increases the body’s ability to convert sugar to energy and, like Chromium, may help aid in glucose maintenance. One of the toughest challenges for people on diets or anyone trying to maintain their weight is a lack of energy and focus. Caffeine is a natural substance that, taken in right quantities, has positive health benefits. As it stimulates the nervous system, caffeine instructs the brain to release epinephrine, which causes an increases demand for energy by breaking down fat cells. Slim+ contains both fast-acting and time-released caffeine, which provides the pick-me-up you’re looking for, the sustained energy you need, and avoids the dreaded crash so many other products deliver. The amino acid L-Tyrosine also promotes metabolism, energy and focus to increase motivation to help attain weight and performance goals. The third metabolic booster in Slim+ is Green Tea Extract (not Green Coffee) that contains both caffeine and EGCG to increase energy. When combined with exercise, Green Tea Extract has been shown to increase hormones that help break down fat. Choline is another nutrient that acts more like a fat transporter than a fat burner and compliments the Green Tea Extract, Caffeine and L-Tyrosine. Choline carries fats (lipids) from the liver and helps promote the body’s use of fat for energy before other sources such as sugar, which are usually burned first. Slim+ is a unique weight management supplement that was created to help overcome the challenges associated with trying to reach weight loss goals; including, appetite maintenance and lack of energy and focus. 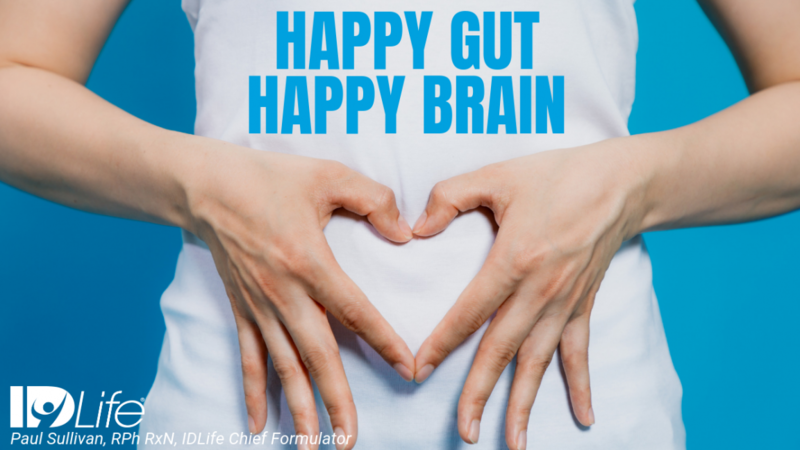 This formula also addresses very recent discoveries of the metabolic puzzle where in fact the Happy Gut/Happy Brain piece is critical for nervous system development, stress response and even appetite control. The perfected formula, as presented above, is just the first step to success. Just as with your IDNutrition Program, Slim+ must be taken regularly (twice daily) to build up all those deficient minerals, prebiotics, amino acids, vitamins, and polyphenols, which potentially contribute to your weight management challenges. Be committed to the process and soon enough the results of Happy Gut-Happy Brain-Smaller Gut will be evident.